The 2012 Star-Spangled Banner Silver Dollar is issued in commemoration of the bicentennial of the writing of the Star-Spangled Banner which went on to become the national anthem of the United States. The silver dollar was released on March 5, 2012 along with the Star-Spangled Banner $5 Gold Coin also marking the occasion. Each silver dollar is struck from a composition of 90% of the precious metal to a diameter of 1.5 inches which are the standard specifications for modern commemorative dollar coins. The United States Mint will produce no more than 500,000 of the Star-Spangled Banner Silver Dollars to either proof or uncirculated condition (shown above). The two coins were released on March 5 at special prices of $49.95 for the proof and $44.95 for the uncirculated. The U.S. Mint scheduled these introductory prices to expire on April 5, 2012 with regular pricing that is $5 more per coin. 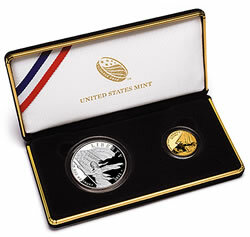 The commemorative coins are available directly from the Mint website at http://www.usmint.gov/catalog. Also available from the Mint, in addition to silver dollars and the proof and uncirculated commemorative gold coins, is two-coin proof set which includes one proof silver dollar and one of the proof $5 gold coins. Its price debuted at $579.30, and can changed weekly depending on whether gold prices move up or down significantly. Congress authorized both the silver dollar and the $5 gold coin with the passage of the Star-Spangled Banner Commemorative Coin Act (Public Law 111-232). The Act was introduced by Congressman C.A. Dutch Ruppersberger of Maryland and was signed into law on August 16, 2010 by President of the United States Barack Obama. "This coin is a great honor and the product of years of hard work in an extremely competitive process," stated Congressman Ruppersberger. "It will help raise much-needed funds so we can properly celebrate the role Marylanders played in our nation’s fight to victory and share that rich history with the rest of the country." Surcharges will be collected on the sale of each Star-Spangled Banner Silver Dollar in the amount of $10. According to the authorizing legislation, the surcharges are to be forwarded to the Maryland War of 1812 Bicentennial Commission for the purpose of supporting bicentennial activities, educational outreach activities (including supporting scholarly research and the development of exhibits), and preservation and improvement activities pertaining to the sites and structures relating to the War of 1812. The obverse of the silver dollar shows the mythical figure of Lady Liberty waving a 15-star, 15-stripe Star-Spangled Banner emblematic of the theme "The Battle of Baltimore at Fort McHenry." Behind her, Fort McHenry can be seen. Obverse inscriptions include LIBERTY, IN GOD WE TRUST and 2012. It was designed by Artistic Infusion Program (AIP) Master Designer Joel Iskowitz and sculpted by United States Mint Sculptor-Engraver Phebe Hemphill. On the reverse, a design emblematic of "The Star-Spangled Banner" (the flag) is shown with a modern American Flag. Reverse inscriptions include ONE DOLLAR, E PLURIBUS UNUM and UNITED STATES OF AMERICA. The reverse was designed by AIP Associate Designer William C. Burgard III and sculpted by United States Mint Sculptor-Engraver Don Everhart.